The Sumatran tiger is in danger of becoming the first major mammal to become extinct in the 21st century, as villagers on the Indonesian island fight a deadly war with the magnificent but ferocious predator. 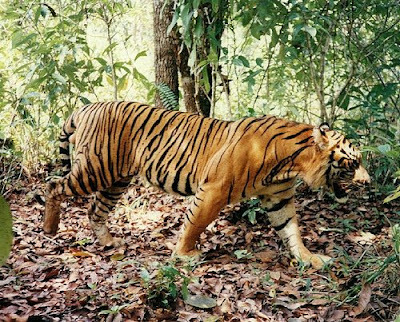 At least four tigers, and nine people, have been killed in the past month alone, as the shrinking of Sumatra’s already depleted forests brings an increase in attacks on farmers, hunters and illegal loggers. With fewer than 400 of the creatures estimated to be left in the wild, the Sumatran tiger is classified as critically endangered, the most vulnerable of all the six surviving tiger subspecies. The fact that several victims of the recent attacks have been devoured by the tigers, which usually have little taste for human flesh, suggests how hungry and desperate they are becoming, as economic exploitation of their habitat confines them in ever smaller and more impoverished patches of jungle.